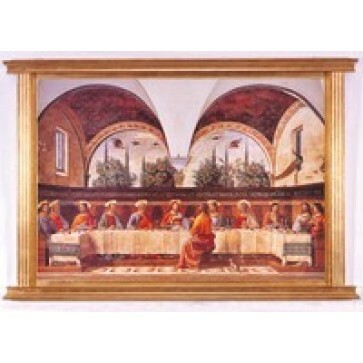 An absolutely beautiful print of the Last Supper by Domenico Ghirlandaio, gorgeously framed in a Florentine wall plaque in overall size 57" x 39". There are only four very similar frescoes of this Last Supper by Ghirlandaio, the one shown here being the most famous is in the Ognissanti Church in Florence, Italy (1480). Another of the Last Suppers is also in Florence in the Museum of San Marco in the Small Refectory. An extraordinary addition to your dining room wall, a true piece of art to enjoy.